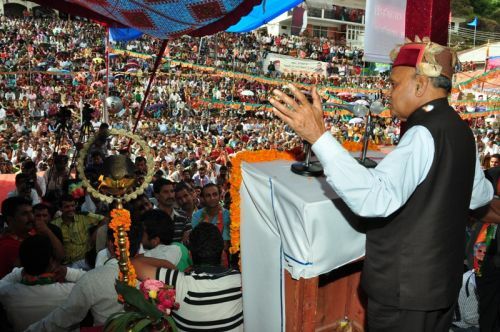 Chief Minister Prem Kumar Dhumal visited Jubbal Kotkhai Constituency and inaugurated two days long Jubbal Festival. He also inaugurated modern bus stand constructed at a cost of Rs. 2.11 crore, car parking constructed with an approximate cost of Rs. 67 lakh and Helipad at Sundali completed at a cost of Rs. 17 lakh. Chief Minister said that BJP Government had always safeguarded the interests of apple and other fruit growers. 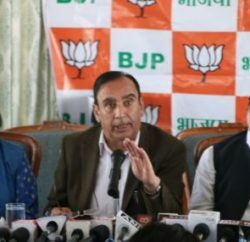 He said that during his last term his Government had cleared the pending payments of apple growers procured during Congress regime amounting to crores of rupees and added that this time also the present BJP Government had cleared the pending payment of crores of rupees for the apple procured under Market Intervention Scheme. He said that the payment for apple procured under MIS last four years had also been made to growers. He said that Congress Government always tried to become benefactor of apple growers and urged people to ask them what they had done for them. Prof. Dhumal while reiterating his Government resolve for strengthening the economy of fruit growers in the State said that the horticulturists have an important role in the economy of the State and said that due to the increase in the support price the farmers and horticulturists would get remunerative prices of their produce. Prof. Dhumal said that Anti-Hail Gun at Kharapathar area had been successful in saving the apple crops from hail-storms and the Government was considering to install Anti Hail Guns in other apple belts of the State to facilitate the fruit growers. I think apple growers are thinking otherwise. He said that more than Rs. 100 crore were spent on construction of roads in Jubbal-Kotkhai, Dharampur area of district Mandi and Jaisinghpur area of district Kangra under NABARD. He said that the social welfare pension had also been enhanced to Rs. 400 per month and as many as three lakh persons were taking benefit of the same adding that all the eligible would be provided social security pension in the State. Chief Minister said that the Government was committed to provide professional education to the youth of the area at their door steps by opening Atal Behari Vajpayee Government Engineering and Technology Institute at Gumma where there was proposal to start B.Tech classes in this session. Chief Minister declared Jubbal Festival as District level Fair and said that SDM Rohru would sit at Jubbal and SDM Theog at Kotkhai for a week in a month to redress the grievances of the people of the area. Besides, Naib Tehsildar Jubbal would sit at Saraswatinagar and Naib Tehsildar Kotkhai would provide its services to the people at Kalbog for a week each. He assured for exploring possibilities and undertaking survey for tunnel between Khaneti to Tikkar and Marathu to Jubbal and also assured for construction of ropeway in the area which would also boost tourism activities. Prof. Dhumal said that a bus service would be made functional between Jubbal to Haridwar via Shimla and assured to upgrade the Girls High School to Senior Secondary School. Chief Minister detailed about various flagship schemes being implemented in the State and said that the State Government endeavoured to provide benefit of these schemes to every section of the society. Schemes worth Rs. 1600 crore were being implemented in agriculture sector alone so as to strengthen the agrarian economy of rural areas, he said. During last four years a sum of Rs. 630 crore had been provided as subsidy on essential edible commodities and every ration card holders in the State was being provided three pulses, two edible oil and salt on subsidized rates and Rs. 140 crore was being spent during current financial year on the same, said the Chief Minister. He said that due to wrong policies of the UPA Government at the Centre, there had been steep hike in prices of all the commodities which had badly hit the common man. Quoting example, the Chief Minister said that during NDA regime at the Centre the LPG cylinder was available at Rs. 220 and now it was Rs. 450 during regime of UPA. 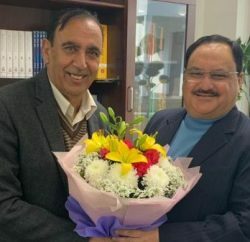 Horticulture Minister Narinder Bragta welcomed the Chief Minister to his own segment and thanked him for dedicating schemes worth crores of rupees in the area. He said that the Jubbal Kotkhai area had witnessed unprecedented development during last four and a half year under the leadership of Prem Kumar Dhumal. He thanked the Chief Minister for construction of Kisan Bhawan at New Delhi and imposing ban on import of apples. He said that it was during the NDA regime that Rs. 80 crore Horticulture Technology Mission was launched which brought qualitative revolution in apple production in the area. He lauded the efforts of the Chief Minister for taking effective steps for curtailing commission being charged by middlemen at Delhi. He thanked the Chief Minister for opening Soil Testing Centre at Kotkhai which has immensely benefited the people of the area. Ashok Chauhan, President, Jubbal Kotkhai BJP Mandal also welcomed the Chief Minister. C.L. Negi, Chairperson, Fruit and Vegetable Growers Association also spoke on the occasion. Many senior officers and prominent personalities of the region were present on the occasion. Apple growers of the Jubbal Kotkhai and Rohru region are facing difficulties due to the bad road and I hope Chief Minister might has observed the real situation of it and will work towards it soon.